One of the smallest & smartest media streamers on the market! 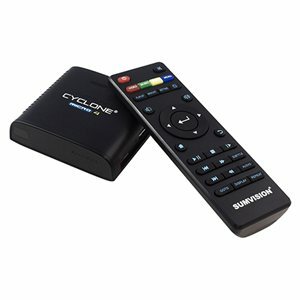 The Sumvision Cyclone Micro 4 is the 4th generation of best selling Cyclone Micro range of media players. This lastest edition enables you to stream movies or music from your PC or any Android device using WiFi to any TV. The Micro 4 works on any TV - including older CRT Standard Definition TV, so you can now stream Netflix or movies stored laptop to even the oldest TV in your house! The possibilities are endless with this little media streamer - play movies or music stored on your Laptop or Smartphone wirelessly on any TV in your house. The new Cyclone Micro 4 supports all the popular 1080p HD video formats. The Micro 4 retains its trademark as the smallest and most portable media player but now with extra features! Using RJ45 network connection or WiFi you can now stream from your computer or NAS box. Now supports up to 4TB external storage or 64GB SDXC card. Comes with peer to peer wireless screencasting technology, compatible with Android Tablets and Smartphones. HDMI Audio & Video can be transferred through an Amplifer then to a TV.